“Pets in the Crossfire of Family Violence,” a one-hour video featuring numerous Link authorities, was aired by Twin Cities Public Television and has been made available to watch free online. 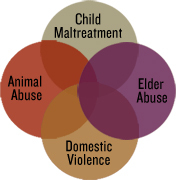 The video, seen below, is compiled from a Link conference at the University of Minnesota College of Veterinary Medicine and discusses the evolving role of pets in society, the links between animal abuse and human violence, child abuse/animal abuse connections, and domestic violence/animal abuse links. Balkin and Jane Hunt, plus experts from family & children’s services, animal-assisted therapy, marriage and family counseling, human-animal bond, and the veterinary college. For further information relating to to “The Link” between animal abuse and human violence please visit The National Link Coalition. This entry was posted in Animal Welfare, Human-Animal Bond, The Link and tagged abuse, conference, criminal, HCAB, Law, The Bond, The Link, video, violence on June 25, 2013 by SCAS.